In one of the least religious countries in the world, an enormous Jesus statue was erected in 1993! According to the last official statistics (from 2014), only 6,2 % of Vietnamese people consider themselves Catholics! Still, among the strong traditions of Buddhism and Vietnamese folk religion, Christian minority pulled the incredible stunt – after 20 years of building and constructing, the concrete Son of God appeared on the southern cape of the Vung Tau peninsula! Built more than six decades after the statue of Christ the Redeemer in Rio de Janeiro, the Vietnamese Christ monument never gained the same touristic momentum. 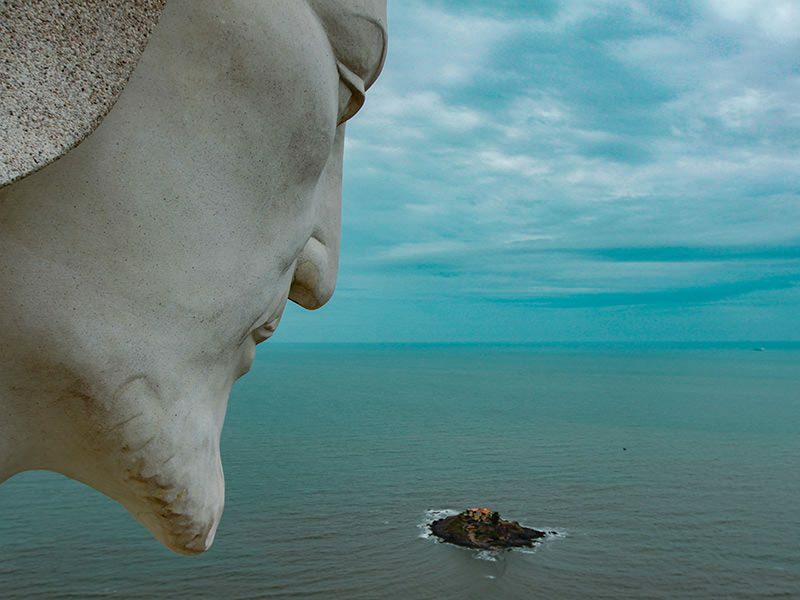 Stretching his arms over the Mount Nho (Small Mountain, 170 meters high) and gazing into the distance of the South China Sea, it might not have the same grandiose aura as the South American icon looking over the colorful Brazilian metropolis from the 700 meters high Corcovado mountain. But that doesn’t make the Vietnamese Christ a no-trump racehorse! OK, on the streets of Vung Tau you might not see barely dressed Vietnamese ladies shaking their bottoms and feather headpieces like tomorrow doesn’t exist. On the streets of Vung Tau, you won’t see kids skipping school classes to play street football while dreaming of becoming the next Neymar. 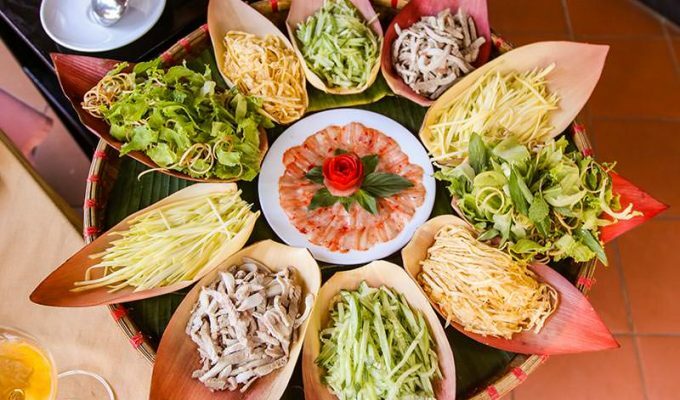 Vung Tau people appreciate pho over moqueca, and would never trade rice wine for cachaça. The two countries might argue which one loves fresh coconut better, or whose coffee wins the race, but when speaking about oversized Biblical monuments, Asian Christ the King clearly deserves his crown! 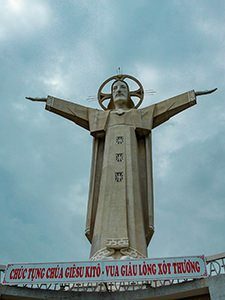 With its 32 meters of height (2 meters more than the Redeemer), Vung Tau Christ might only seem smaller, as his pedestal is just 4 meters high. 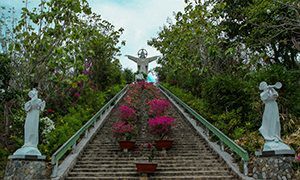 However, Jesus statue of Vung Tau provides a very particular benefit – one can climb into it and admire the views of the town and the whole coastline from Christ’s perspective. You won’t get these divine views even at the base of the statue, due to the overgrown trees. But Jesus sees it all! The trick is only that you need to climb the mountain and Christ’s interior yourself, there is no cable car you can pay to do the physical work for you! Available data disagrees on how many steps you need to climb to get to the monument’s platform. Some say there are 1000 steps, some exaggerate with even 1200, but the closest guess would be 800-ish. I haven’t counted them myself, but I am certain the numbers stopped being presented after the 800 mark. From my point of view, the obstacle is not the number of steps, but their relative shallowness. 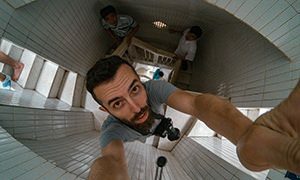 As 185 centimeters tall guy, I felt that the steps, sometimes just 10 centimeters high, are more tiring than the steps you would normally find in the buildings of the Western civilization. The pro-Asian-foot design gave me the feeling that I am always lifting my legs but not achieving much. And that’s what felt tiring! Some Westerners would disagree with me. They think more small steps is less tiring than less of the normal-size ones. Well, you be the judge! 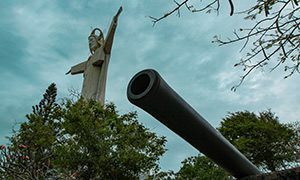 Vung Tau’s Christ the King is protected by – cannon! In any case, resting stops are provided along the way. As this is a religious site, one might use the stops to pray, and I guess Biblical statues, chubby angels, apostles, and pietas could be inspiring for that call. Otherwise, just take a moment to breathe in, admire the fake deer drinking from the artificial lakes, enjoy the floral gardens and bonsai trees, or just rhetorically ask yourself why the chickens are caged. Christ the King – only for decently dressed! The Jesus statue is well hidden behind the hill’s topography and trees growing on its slopes. Its whiteness will reveal to you only at the last set of the steps (this is the set when you forget to count the stairs and start to take selfies with outstretched arms, like so many before you). The admission to the statue is free, but beware, if not properly dressed, you might need to do some unplanned T-shirt shopping at the hilltop. In the monument sleeveless shirts and tops, short pants and miniskirts, but also shoes, hats and bags are prohibited. Omnipresent warnings about pickpockets operating in the area make you think twice whether you should leave your valuables at the entrance of the statue. I have visited Vung Tau on Monday, so the monument area did not seem as crowded as it might get on the weekends. The day was cloudy enough that I didn’t mind climbing the hill at noon. If you want to take a picture of the Christ without random strangers protruding their heads through his shoulders, the lunch break between 11:30 and 13:30, when the statue closes to visitors, is truly your safest bet! Also, the tourists don’t crowd it at 13:30 exactly, so this is the moment you could get lucky enough to not having to wait in the queue for the balconies in Christ’s shoulders. The staircase where you’ll need to wait is narrow. And the balcony is maybe an oversized word – let’s just say that on the top of the 133-step spiral marble staircase inside of the statue two hollows let you squeeze out to get that nice sea breeze. Two, maybe three friendly strangers can fit in at one time. Glowy Family – beat the dark forces with some phosphorus! Vung Tau Christ has rules for you! Besides expected signs for no smoking and no littering, they will also advise you that running, loud speaking, writing or drawing on the wall, consuming food and drinks, and spitting is forbidden. Also, “no getting drunk and vomiting”. Maybe you could pass with just being drunk or just vomiting, not sure. For the rules they couldn’t find the adequate pictogram, the full sentence is provided, for instance: “Do not show unworthy and profane acts between couples in this sacred place.” Then again, I think even the solo profane acts would not be that welcomed! It makes you wonder how did they come with this being a potential issue. When leaving the mountain, do drop by at the souvenir shop! You can have your own miniature Jesus statue for already 10.000 Dongs (40 Cents!). The price grows with the size of the Christ, and some of them come in the phosphorescent form, which means they glow in the dark! 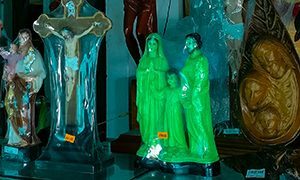 For 240.000 Dongs (10 Euros) you could get the whole Holy Family that will enlighten your room in green. If they pulled it off in Medjugorje with the Madonna miraculously glowing in the dark, just think what kind of profitable investment the whole glowing family could be! 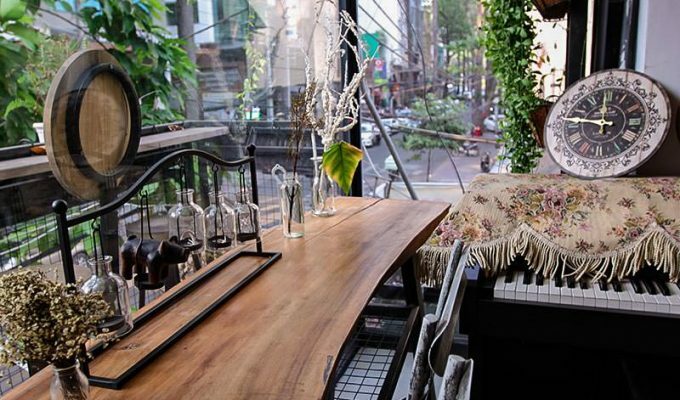 Searching for a place to stay near Vung Tau Christ monument? 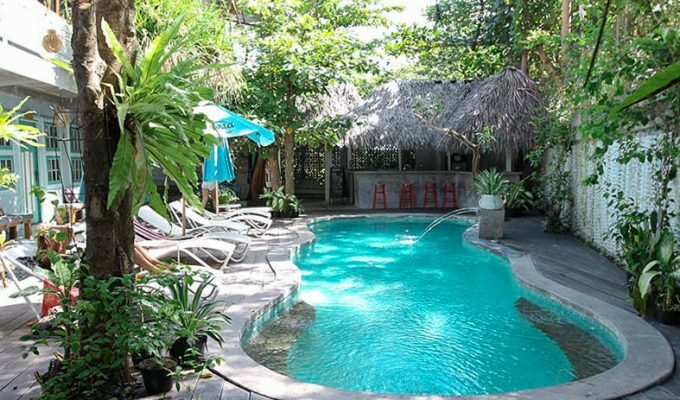 Browse booking.com for the best accommodation offers or check these hot deals in the area! Do your homework Ivan. Catholicism has play a significant role in Vietnam since arriving over 500 years ago. They built hospitals, schools and many other social welfare agencies that persist today. One of their missionaries produced the foundations of what has become the current Vietnamese language. Catholics also have been subjected to persecutions every bit on par with the Muslims in Burma today. The last was from the communists since 1975. Almost 700,00 boat people were boat people. Today Catholics Vietnamese are largely very educated and productive. They are very important to the Vietnamese economy and society through their contribution to health, education and social welfare. They are a dynamic minority who do not need to perform stunts to demonstrate their faith. Lift your game Ivan – there is a large plank in both of your eyes. 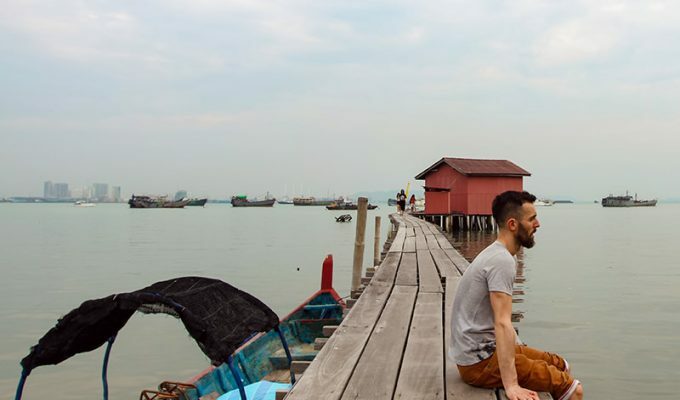 I haven’t been writing at all about the “level of faith” of the Catholics in Vietnam, or about the lack of their contribution to the Vietnamese society. But there, you did. I hope that helps your feeling of self-fulfillment. What I did write about is that there is a very large monument of Christ in a country where Catholics are a tiny minority (even you call them a minority, so I guess we cannot disagree on world statistics). If I was doing anything with this article, I was promoting this monument, that many people in the world did not even hear about! Building such a large Jesus statue IS a stunt/feat/accomplishment. It would be the stunt even in the country with a Catholic majority. There is no reason that the word “stunt” should be treated as offensive. It is an impressive accomplishment. 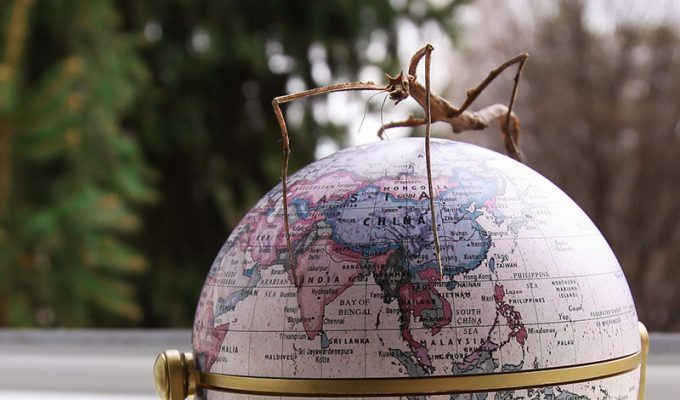 The metaphor with a plank – it was me who felt that the Judgement Day has arrived after reading your comment. Thanks for fighting for Catholicism in such a passionate way! Sometimes, that is just a lame excuse for unreasonable attacks, the history is full of those examples as well. Your arguments would resonate better if formed in a constructive phrasing. Thanks Ivan. Many places for tourists in Vietnam are closed on Mondays, so your comment about going to the Jesus statue on a Monday was very helpful (today is Monday and we’re on our way)! Oh, I am glad the article was helpful! Do let me know how did you find your visit! Did you enjoy it?